Sitting at the southern tip of Spain where the Mediterranean meets the Atlantic, the tiny British colony of Gibraltar marked the end of the known world in ancient times. The famous Barbary apes are a notable attraction here; they are Europe's only wild monkeys and are considered a symbol of British rule. 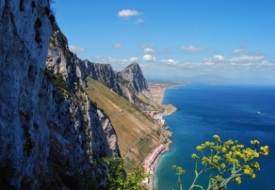 Shore excursions highlight the village of Catalan Bay, Europa Point and its lighthouse and the enormous cavern known as St. Michael's Cave.